Three Loops Are Better Than One! The EN Snare® device was developed by Hatch Medical’s device incubator and serves as an excellent case study for its risk-sharing business model (see press release 1 and press release 2). Use the EN Snare® for unmatched performance in foreign body retrieval and manipulation in the cardiovascular system or hollow viscus. Self-sizing EN Snare® features 3 interlaced loops that combine excellent vessel coverage with superior ability to capture, retrieve or manipulate objects. Rotating EN Snare® during use provides positive engagement with targeted objects. 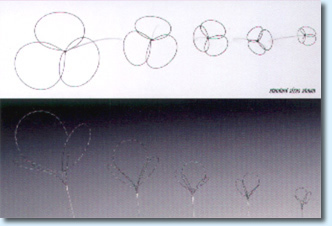 Cabled EN Snare® loops with interwoven platinum strands provide excellent fluoroscopic visualization. Super-elastic nitinol wire provides a winning combination: superior flexibility, kink-resistance, and 1:1 torque control for exceptional steerability. Unique product design creates overlapping diameters within product range, thereby reducing inventory requirements. 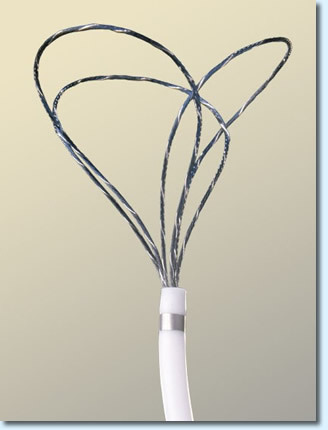 Highly lubricious, kink resistant guiding catheter includes a radiopaque band that is easily visible during fluoroscopy. 6F and 7F sizes feature a unique “angled” tip, which allows the catheter to be steered during difficult placements. Click here for additional details on the Merit Medical website. The EN Snare® device is available in 7 sizes. Its unique design allows the device to “self-size” to fit most blood vessels. Each system includes: EN Snare®, Snare guiding catheters, snare introducer/back loading device, hemostasis valve with “Y” connector, and steering handle. Ensnare is a registered trademark of Merit Medical Sytems.